Like the Iraqi government before him, Afghan President Hamid Karzai is refusing to agree to an ongoing occupation with U.S. forces immune from prosecution for crimes. 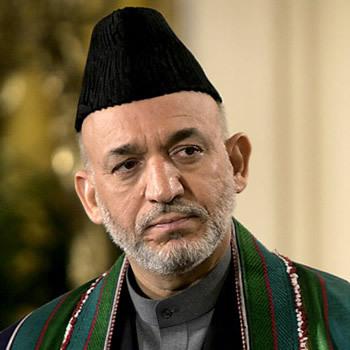 Before signing off on an ongoing military presence, Karzai says he would like the U.S. to stop killing civilians and stop kicking in people's doors at night. He'd like the U.S. to engage in peace negotiations. He'd like Afghan prisoners freed from Guantanamo. (Of the 17 still there, 4 have long since been cleared for release but not released; none has been convicted of any crime.) And he says he'd like the U.S. not to sabotage the April 2014 Afghan elections. I urge you to continue to say no to 10 more years of U.S.-NATO occupation. The world is with you on this.